Perhaps I'm somewhat putting words in Audie's mouth, but if I understand her sentiments, I think it would be wise for many Christians who discuss creation, the flood and the like to pay attention. First, regarding RTB, they have bible scholars, and have rubbed shoulders with some of the best (e.g., Gleason Archer). Hugh Ross has had a particular ministry that I'd say was blessed and done much good. Equally, blessed are other places suchas BioLogos, and then this re-badging of getting back to an ANE understanding as something new or novel (e.g., Heser, Miller). To be clear, such an understanding is neither new or novel, but the main foundation of the Historical-Grammatical hermeneutic which all such Evangelical minisitries embrace and paid close attention to. Further what we have or see historically with a Biblical creation account, which many find suspicious and repulsive, are new interpretations of Genesis coming onto the scene in accordance with modern ideas or understandings. Such interpretations are often persuasively presented like it is being read from the words of Scripture itself (exegesis), when infact eisegesis (reading ideas into the text) is normally being performed. Only, the drawn into a particular interpretation, often can't see this as being the case. I think anyone who comes out with a new and novel understanding of Scripture, they're making the same errors as all such creation-based ministries of the past have done. First, they're fixating upon explaining how to make compatible their own modern understanding of the world, and interloping that with an interpretation of Scripture and how it must be read (to the derision of all other interpretations). They themselves are providing a hard and fixed interpretation. In actuality, Scripture isn't so rigid, and when interpreted it isn't necessarily fixed but quite open to all sorts of valid insights and possible understandings. There is actually much room for different interpretations (even misinterpretation). Instead of fussing about which interpretation is correct, far better in my opinion is it to say which interpretations can be logically understood, are allowable or tolerable. Yet, people become very enamoured and fixated upon getting the "right" answer, which I see feeds into Audie's expressed sentiments here. With Scripture, I believe it is often left open-ended on many issues, just like our understanding of nature. This doesn't mean the greater context is lost of experiencing nature or understanding the central story which carries across all the books of the Bible. This story being one of humanity's relationship with God becoming severed, reading through history entwined with theology to do with Israel who God reveals Himself to and takes as His own people to strive with, though they are recorded by their own scribes as constantly turning away from God over and over. This leads to their prophets talking of Messiah who would come to bring about a new covenant, one that is of the heart rather than adhering to a bunch of rules. (Jer 31:33) We Christians identify the Jewish Messiah as Christ, through whom people from all nations can be reconciled to God. This fixation people have over getting the correct interpretation is just wrong. It's like asking the correct understanding of physics or the like, what is the theory of everything? We might get more or less close, but unless such be revealed to us in some more objective sense, we'll be either hit or miss due to our own subjective tastes and proclivities. Have your opinion, but I think it better to leave Scripture open to many interpretations rather than arrogantly say there is only one interpretation, this is it, and look it aligns with a modern scientific understanding or evolutionary accounting with this and that verse (often it seems to me a verse where a whole lot is being read into). Fact is, as I see matter, Scripture doesn't leave it up to us, or allow us, to be decisive over a many great number of things. And, I see many strength to such, rather than it being weakness. It allows those who are interested to do so, to dig in deep and explore all sorts of possibilities, and while being drawn to this or that explanation/interpretation. Audie wrote: "Same", meaning discovery. Ah ok, I understand now. My sardonic side might describe myself as lazy, but I’m just content with my answer. And I don’t think there’s anything wrong with being content. It’s bliss. 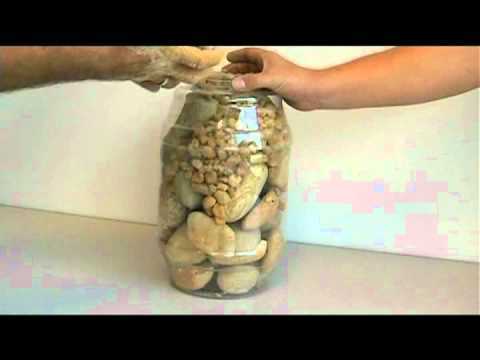 Take this jar of rocks. Place the big rocks in first, then the little ones can fit around them. Answer the big questions in life, and all the little things take care of themselves. DB: Since Noah's Flood (as described in Scripture) occurs at the same time and location as the Sumerian deluge described in Mesopotamian literature, I am convinced that the Scriptural account of Noah's Flood and the Sumerian deluge legend are basically referring to the same historical event. (even if the descriptions are not identical). ExtraScriptural Sumerian literature confirms the Scriptural time and location for Noah's Flood, as occurring in Mesopotamia around 3000 BC. Genesis 4 (which occurs BEFORE Noah's Flood) describes behavior that took place during the Neolithic Revolution in Mesopotamia, so I don't think a pre Neolithic Revolution date for the Flood is even viable from a Scriptural perspective. So since internal Scriptural evidence and external extraScriptural evidence from Sumerian history both point to around 3000 BC... Then I go with sometime around 3000 BC. And the Septuagint time between the Flood and the birth of Abraham is 1172 years. That would bring the flood to around 3000 BC (which corresponds to the timeframe of the Mesopotamian Deluge). That would give us a time frame of around 5200 BC for Adam. Genesis 4 tells us that Adam's son, Cain built a city, and the first Mesopotamian cities were built in the 4000-5000 BC time frame, so a 5000-6000 BC time frame for Adam corresponds to the time frame we would expect based on the time frames for the first Mesopotamian cities. So I think the Septuagint genealogy time frames for Adam and Noah line up pretty well with what we see in Mesopotamian archaeology and history. Oops, messed up in my math reference above - meant to say a calculation of the time between between Adam to Christ's birth, or a BC date for Adam's creation. Kurieuo wrote: Perhaps I'm somewhat putting words in Audie's mouth, but if I understand her sentiments, I think it would be wise for many Christians who discuss creation, the flood and the like to pay attention. I thought what I said was pretty simple. It appeared someone was anticipating going to heaven to be handed all the answers. Does not appeal to me. I'd prefer the privilege of continuing to study and grow. What could be more boring than being given the answer. Lookee what you get for Christmas! An assembled jigsaw puzzle! As for significance of the right answer your Noah's ark story is as good as any, better than most. errors. That somehow feels important. Maybe too there really is a WWCOSTDG - the world wide conspiracy of scientists to deny God. And from just the pov of relationship with God-the flood is an incalculably hortific act. at the end of a lifetime believing and spreading such a vile accusation. I don't think there is a WWCOSTDG , in fact many believe in God. Go figure, right? Kurieuo wrote: I don't think there is a WWCOSTDG , in fact many believe in God. Go figure, right? I figure that belief in God does not require that one be a idiot. No, err... well... if I'm honest I've been called an idiot plenty of times. I'd like to think I'm not though. So, is the opposite belief of that statement that one figures unbelief in God requires one to be an idiot? that goes on sround here?